Regulatory agencies that are responsible for horseshoe crab conservation are listed below by U.S. state and by other countries. We highlight the Atlantic States Marine Fisheries Commission (ASMFC) as a model of interstate fisheries management. Imagine what could be achieved if a comparable governing body could be established between the 14 countries that comprise the spawning range of the three Asian horseshoe crab species. For over 70 years, the Atlantic States Marine Fisheries Commission (ASMFC) has served as a deliberative body of the Atlantic coastal states, coordinating the conservation and management of 25 nearshore fish species. Each state is represented on the Commission by three Commissioners: the director of the state’s marine fisheries management agency, a state legislator, and an individual appointed by the state’s governor to represent stakeholder interests. These Commissioners participate in deliberations in the Commission’s main policy arenas: interstate fisheries management, fisheries science, habitat conservation, and law enforcement. Through these activities, the states collectively ensure the sound conservation and management of their shared coastal fishery resources and the resulting benefits to the fishing and non-fishing public. New Hampshire Fish and Game works in partnership with the public to 1) conserve, manage, and protect the state’s fish, wildlife and marine resources and their habitats; 2) inform and educate the public about these resources; and 3) provide the public with opportunities to use and appreciate these resources. The Marine Fisheries Division of New Hampshire Fish & Game manages resident and migratory estuarine and saltwater species. The Division also manages the Great Bay Estuary Research Reserve and the Great Bay Discovery Center. Its staff works closely with other states and federal agencies to protect and maintain marine resource and their habitats for both commercial and recreational fisheries as well as resident and migratory species throughout New Hampshire’s coasts and estuaries. Note: New Hampshire Fish & Game initiated a study in 2001 to identify and monitor potential horseshoe crab spawning and nursery habitats within Great Bay Estuary. The study was conducted from 2001 to 2010 with different variations of methodologies. In 2012, the University of New Hampshire in partnership with the New Hampshire Sea Grant Coastal Research Volunteers and the Great Bay Discovery Center adapted the New Hampshire Fish & Game’s study, and began to research the environmental influences on horseshoe crab population dynamics and behavior in Great Bay Estuary, conducting extensive surveys to monitor horseshoe crab spawning activities. This program became the University of New Hampshire Horseshoe Crab Monitoring Program, involving citizen scientists (volunteers from the community) conducting horseshoe crabs surveys in Great Bay Estuary. The program also integrates tag-recapture methodologies of horseshoe crabs in Great Bay Estuary, and contributes New Hampshire horseshoe crab results to the nationally-recognized United States Fish and Wild Service Horseshoe Crab Cooperative Tagging Program, providing data on distribution, movement, longevity, and mortality of horseshoe crabs. Massachusetts Division of Marine Fisheries is responsible for development and promulgation of the Commonwealth’s rules and regulations governing commercial and recreational fishing. As it pertains to horseshoe crabs, the agency is responsible for laws and regulations, enforcement, permitting and licensing, resource assessment, habitat protection, education and training. The agency holds a position on the ASMFC Board, Horseshoe Crab Advisory Panel and Technical Committee. The agency also partners with the University of Massachusetts system, especially the Massachusetts Marine Fisheries Institute (MFI), the United States Geological Survey, the National Marine Fisheries Service, the United States Fish and Wildlife Service, and the coastal states and political sub-divisions from Maine to Florida. Connecticut Department of Energy and Environmental Protection’s Fisheries Division is responsible for development and promulgation of the state’s rules and regulations governing commercial and recreational fishing. As it pertains to horseshoe crabs, the agency is responsible for laws and regulations, enforcement, permitting and licensing, resource assessment, habitat protection, education and training. The agency holds a position on the ASMFC Board and Technical Committee. The agency also partners with the University of Connecticut, the United States Geological Survey, the National Marine Fisheries Service, the United States Fish and Wildlife Service, and the coastal states and political sub-divisions from Maine to Florida. New York State Department of Environmental Conservation (NYSDEC) is responsible for the states rules and regulations governing commercial and recreational fishing. As it pertains to horseshoe crabs, the agency is responsible for the laws and regulations, enforcement, permitting and licensing, resource assessment, habitat protection, education and training. The agency holds a position on the ASMFC Board and Technical Committee. The agency also partners with Stony Brook University, Cornell Cooperative Extension, the United States Geological Survey, the National Marine Fisheries Service, the United States Fish and Wildlife Service, and the coastal states and jurisdictions from Maine to Florida. NYSDEC funds the NY Horseshoe Crab Spawning Survey which is a citizen science program that provides state managers with an index of spawning activity at coastal locations stretching west from Staten Island and East to Fisher’s Island. Funding for the spawning survey is provided through New York Environmental Protection funds through the Ocean and Great Lakes Program. New Jersey Division of Fish and Wildlife is responsible for development and promulgation of the state’s rules and regulations governing commercial and recreational fishing for most species. As it pertains to horseshoe crabs, the agency is responsible for enforcement, permitting and licensing, resource assessment, habitat protection, education and training; however, legislative action in 2008 was taken to indefinitely prohibit the taking and possession of horseshoe crabs from New Jersey waters (NJ P.L 2008). Repeal of these statues will require further legislative action by the State of New Jersey. The agency holds a position on the ASMFC Horseshoe Crab Management Board and Technical Committee. The agency partners with the United States Geological Survey, the National Marine Fisheries Service, the United States Fish and Wildlife Service, and the coastal states and political sub-divisions from Maine to Florida. Delaware Division of Fish & Wildlife is responsible for development and promulgation of the State’s rules and regulations governing commercial and recreational fishing. As it pertains to horseshoe crabs, the agency is responsible for laws and regulations, enforcement, permitting and licensing, resource assessment, habitat protection, education and training. The agency holds a position on the ASMFC Board, Horseshoe Crab Advisory Panel and Technical Committee. The agency also partners with the University of Delaware, Delaware State University, the Ecological Research & Development Group, the Nature Conservancy, the Delaware National Estuarine Research Reserve, the Delaware Center for the Inland Bays, the United States Geological Survey, the National Marine Fisheries Service, the United States Fish and Wildlife Service, and the coastal states and political sub-divisions from Maine to Florida. The DDFW is responsible for funding the Delaware Bay Horseshoe Crab Spawning Survey which provides model parameters for adaptive resource management of Horseshoe Crabs in the Mid-Atlantic region. Maryland’s Department of Natural Resources Fishing and Boating Services has a management framework for horseshoe crabs for the conservations and equitable use of the resource. The department manages the resource in balance with the ecosystem for present and future generations. The agency is responsible for laws and regulations, enforcement, permitting and licensing, resource assessment, habitat protection, and education.The department monitors and assesses the status and trends of the resource with several surveys and works with ASMFC to manage the coastal horseshoe crab population.The department partners with the Maryland Coastal Bays program (National Estuary Program) on a citizen based volunteer program to monitor spawning populations in the coastal bays. North Carolina Division of Marine Fisheries (DMF) is responsible for the stewardship of the state’s marine and estuarine resources. The division’s jurisdiction encompasses all coastal waters and extends to 3 miles offshore. Agency policies are established by the 9-member Marine Fisheries Commission and the Secretary of the Department of Environmental Quality. North Carolina is a member of the Atlantic States Marine Fisheries Commission, the Mid-Atlantic Fishery Management Council and the South Atlantic Fishery Management Council. As it pertains to horseshoe crabs, the department is responsible for regulations, enforcement, permitting and licensing, resource assessment, habitat protection, education and training. 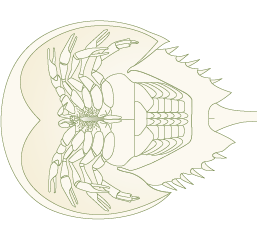 The department holds a position on the ASMFC Horseshoe Crab Board and the Horseshoe Crab Technical Committee. The department also partners with various universities, state and federal agencies and other states from Maine to Florida. South Carolina Department of Natural Resources – Marine Resources Division (SCDNR-MRD) works with the South Carolina General Assembly to develop the rules and regulations governing commercial and recreational fishing. As it pertains to horseshoe crabs, the agency is responsible for enforcement, permitting and licensing, fishery management, resource assessment and habitat protection. The agency participates in the USFWS HSC tagging program and collaborates on research projects with a variety of partners, including Sea Grant, local universities, and Charles River Endosafe to better understand population genetics, abundance and movement, as well as habitat preferences. The agency holds a position on the ASMFC Board, Horseshoe Crab Advisory Panel and Technical Committee. Georgia Department of Natural Resources, Coastal Resource Division is entrusted to manage Georgia’s coastal marshes, beaches, waters, and marine fisheries resources for the benefit of present and future generations. As it pertains to horseshoe crabs, the department is responsible for laws and regulations, enforcement, permitting and licensing, resource assessment, habitat protection, education and training. The department holds a position on the ASMFC Board and the Horseshoe Crab Technical Committee. The department also partners with various universities, state and federal agencies and other states from Maine to Florida. Florida Fish and Wildlife Conservation Commission (FWC) is responsible for horseshoe crab conservation and management issues within Florida. Besides being responsible for enforcement of laws and regulations, the agency also educates the public about horseshoe crabs and engages citizens in helping gather information on horseshoe crab populations. Working with the University of Florida, SeaGrant and other NGOs, a citizen-science initiative was created and is expanding to key areas statewide in order to scientifically monitor horseshoe crabs. These initiatives will help the FWC better understand the population dynamics, movement, genetic variability, habitat issues and potential threats to this species, which will in turn help in making effective management decisions. FWC holds a position on the ASMFC Board and the Horseshoe Crab Technical Committee. Alabama Department of Conservation and Natural Resources there are no regulations in Alabama regulating horseshoe crab harvest. However, if you are doing any kind of wildlife or biota sampling you need an Alabama Marine Resources Division permit and if you are taking from National Park Service areas, you will also need an National Park Service collection permit. Note: horseshoe crabs are not listed as a nationally protected species in China, therefore harvesting regulations and trade are handled on a provincial level. There are four provinces in China where horseshoe crabs can be found. Despite being listed as Key Protected Aquatic Wildlife in these four provinces (Zhejiang, Fujian, Guangdong, Guangxi), T. tridentatus populations are under heavy exploitation to meet the increasingly high demands for TAL production and local food consumption (Liao et al., 2001; Hong, 2011). The Biodiversity Conservation Agency (BCA) under the The Vietnam Environmental Administration (VEA), implements the functions of the Ministry of Environment and Natural Resources (MONRE) in performing state management and managing law enforcement in conserving and utilizing sustainably biodiversity resources in the country, which includes horseshoe crabs. India Ministry of Environment, Forest and Climate Change (MoEFCC) is the nodal agency in the administrative structure of the Central Government for the planning, promotion, co-ordination and overseeing the implementation of India’s environmental and forestry policies and programs. The primary concerns of the Ministry are implementation of policies and programs relating to conservation of the country’s natural resources including its lakes and rivers, its biodiversity, forests and wildlife, ensuring the welfare of animals, and the prevention and abatement of pollution. While implementing these policies and programs, the Ministry is guided by the principle of sustainable development and enhancement of human well-being.